Amaze your friends and family by growing unusual plants in the polytunnel, greenhouse or the kitchen windowsill, it’s easier and more fun than you might think! Pineapples are great fun to grow, so long as you avoid having your eyes put out by the developing sharp leaves! You have been warned! Some supermarkets pull out the growing point of the plant, thus increasing its shelf life. However no amount of potting and watering will make these crowns grow. Choose a plant that is completely intact. Of course make sure the fruit is edible because we do not need this part for the growing process, so you might as well enjoy it. Some people slice the top with a little flesh beneath; others just twist the crown so it comes away in the hand. Either method is fine so long as there is no flesh attached to the leafy part of the plant. Once this is done, carefully remove the lower leaves to expose the rootlets, which look a little like a maggot infestation. The tops should be left upright for a week to dry a little. 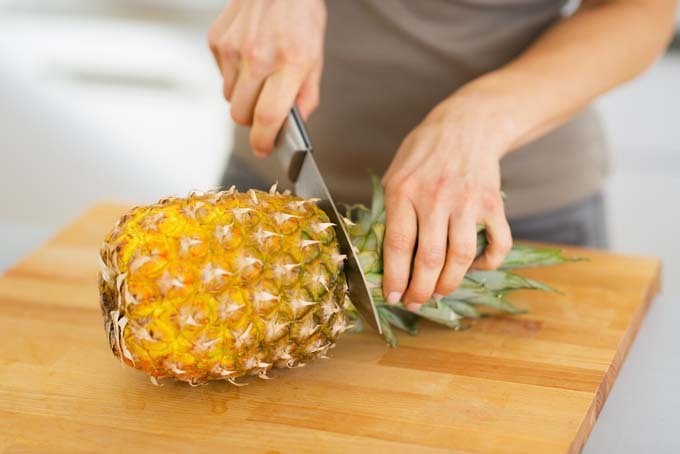 Pineapples are susceptible to fungal infections, if you allow the leaves to get too wet it will undoubtedly rot. Should it show any signs of rot, discard and burn. The embryonic roots need to be tempted into life. This can be done by soaking them for a week in water, being careful not to soak the whole plant, then planting the base of the pineapple into a 20 cm (8 inch) pot filled with good quality compost. Water the compost so it remains slightly moist, not wet. This stage might take several months but eventually the plant will resist your pulling at it, indicating root growth. The outer leaves die off, and should be removed. This is a natural part of the growth of the plant and if you look carefully you will see their replacements in the centre. The plant will need to be repotted after a year into a 25 cm (10 inch) pot and it will grow to around 60 cm (2 ft) in the next year. Sparingly water your plant, so the compost is lightly damp and once a month during the summer feed, with an all-purpose fertiliser. Keep it free from frost at all times, but you can take it outdoors in the summer. A minimum nighttime temperature of 13 C is important. At around two years old the plant will flower. Around six months later you will have a small fruit. You can initiate flowering by using the plant hormone ethylene. This is released by bruised apples and other ripe fruit, which need to be in close proximity to the plant. It will take around six months for your pineapple to grow to any reasonable size, and is ready when the outer shell is golden.